I was in my beloved Trader Joe’s. 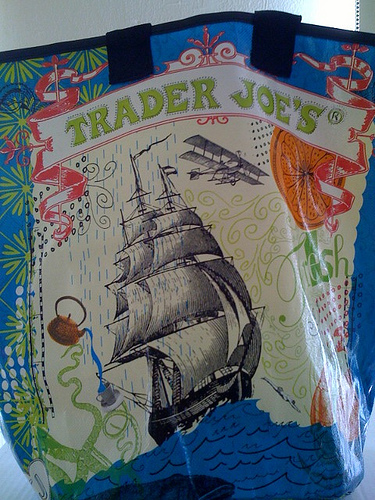 Trader Joe’s offers one of the happiest shopping experiences to be found in the USA. Music, such as Soul Kitchen offers a pleasing background vibe. A brass Captain’s bell is struck for customer service, there is a First Mate and the store is adorned in a Hawaiian garland theme. Amongst the shelves a peluche chimp, named Beth, hides for bored children to find and as part of its irreverant stance it sources food from all over the globe while cutting out the middle man. All this means you are not fleeced as you are at Whole Foods, known with bitter affection as Whole Pay Check/Cheque nor are you reminded that you are the smallest cog in the mechanics of consumerism as you are in Giant, where humans are being replaced by automated check-outs, that would, were they human, be fired for their inefficiency. In Trader Joes, all the staff has a quirk of one type or another. They wear ridiculous hats, have giant tattoos of Bob Marley lavishly sprawled down both arms or they have pink hair and are vegetarian but don’t eat vegetables and are conversational on the subject. In our local Bethesda store, in addition to the above fanfare of characters there is a growing team of Senegalese who conduct a full-bodied dialogue in French above the customer’s heads as they pile your fare onto the wooden counters and then un-pile it into some of the chicest shopping bags to be found. There is no conveyer belt. Sadly the karma of my latest trip was marred. My shopping trolley was happily stocked with a Tarte Alsace (I can testify that the Alsace has nothing as tempting to offer after a painful walking holiday eating dried fava beans from the fields in order to make it to the next abandoned, bombed-out village, presided over by an insane dog – what is it about French dogs? ), a chunk of faintly whiffy Delice de Bourgogne, several Quattro Formaggi Pizzas (by Trader Giotto) and some marinated Mahi Mahi. I was somewhere between the organic lettuce and retrieving a package of loo roll decorated with Victorian ladies showing their ankles to moustached gentlemen, when I was arrested by a grumpy man. “Did no one ever teach you to say Excuse me?” I was taken aback and offered a genuine apology. One of Trader Joe’s idiosyncrasies is that it is tight, or intimate, for a better word. One is forever squeezing in between people to get to one’s attempted destination. I have been doing this for years in the usual British fashion which requires one to wince, make it evident that one is somehow squeezing one’s frame into pipe cleaner-like format and then offering a half smile of apology at the circumstances. It now dawns on me that I have been offending people left right and centre –which pretty much covers the political spectrum. As I stood watching my purchases being piled and un-piled at the wooden counter I realised that I have never actually said “Excuse me.” I have generally observed that when people say “Excuse me” it is said with a righteousness and indignation that defies the supposed intention of the words. “Excuse me” typically means, “Get the hell out of my way”. It is rarely courteous or polite. In fact I think it is very hard to make it sound polite. “Excuse me”, unless one conjures up the phantom of a preliminary “Would you?” falls into the imperative. It demands that the other person excuse one whether they like it or not. “Not only am I going to trample through your personal body space but I am going to demand that you acquiesce and approve.” If anything, it adds insult to injury. So to my offended shopper I must say “No, my mother did not teach me to say “Excuse me”. I was raised with the sense that both “Pardon me” and “Excuse me” were pretty much not done, with the former being somewhere near the boiling point of vulgarity and the latter in the lower degrees of discourtesy. I was taught the appropriate way to go about all this was to stay mute or possibly to offer something along the lines of “I’m so sorry…” and tail off enigmatically into the pipe-cleaner impression. One was not to stipulate what one was sorry about – it was just a generally sorry ness about the state of things, one’s involvement in them and the forced involvement of the other party. The suggestion being that there is no solution and that life is a mine-field to be trodden with caution. The problem is that whilst this form of self-effacement holds wide appeal to one’s fellow shoppers when beheld on the silver screen and abused by Colin Firth and Hugh Grant, it tends to get you weird looks in CVS. As a legal alien, I’m in a fix. My voice cracks with embarrassment at the thought of saying ‘Excuse me” and I fear that if I start up the “sorry” rigmarole again I will find myself back at square one in the alien land where Johnson’s baby shampoo is kept under lock and key. Perhaps the time has come for something out of the box. A Trader Ming-like oriental flourish, a full bodied bow that brushes the floor to sweep all indignation aside. This entry was posted in Quill & Ink: Scrolls and tagged etiquette, Legal Alien, Manners, Trader Joes. Bookmark the permalink. 2 Responses to Excuse me, or not. Great piece! And you didn’t even stoop yourself to address the ‘gentleman’s’ rudeness of (supposedly) correcting you like he did… Keep on writing, I love it!